We love our dogs. They're always there for us, for a cuddle, or a few hours of fun in the park. They're sweet, devoted, and you can't beat a dog for companionship, on a run, or lounging around the house. Dogs take a lot of work. Feeding, walking, and grooming are just part of the responsibilities. Nobody wants the smell of dog to upset the nice clean house. It makes it hard to entertain, and embarrassing when visitors are around. Cleaning up after your dog doesn't have to be complex. Following a few simple 'house rules' where your dog is concerned will make sure you can enjoy your dog's company, but avoid the mess, and the smell! A clean dog is a healthy dog! Some dogs require more grooming than others, and you should definitely consider the grooming needs of your breed, but the more often your dog is washed and groomed, the less likely shedding will occur. A clean dog is less likely to smell, too! Getting your dog used to the bath is as simple as making it routine. 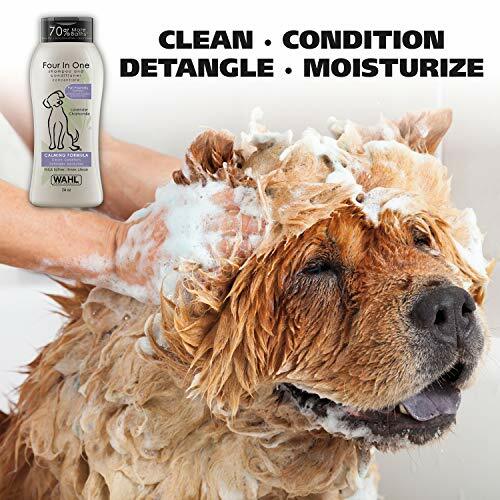 Keep the water at a reasonable temperature, and choose a dog-friendly shampoo, to prevent dry skin. Most dogs love being groomed! The brush will depend on the breed and hair type, so you might want to consult a pet shop or vet clinic before picking one up. Brush every few days, and bathe at least every two weeks, and you'll see a huge decline in the shedding problem. Plus, it means more quality time with your best buddy! 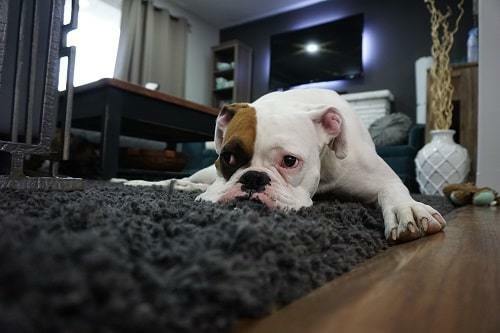 Keeping your floors free of pet dander is a good way to cut down on odors. That means regular sweeping and mopping. If you're keeping the floors clean, and still noticing problems, have a look around for trouble spots. A dog being house trained tends to go in the same spot when he has an accident. 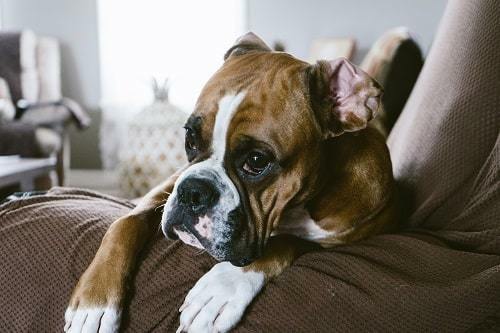 If you've noticed anxiety, or other health issues in your dog, it may also be a signal that there have been some accidents. Check behind and underneath furniture. Treat stains with lemon juice or vinegar spray of 1 part lemon or vinegar, to 4 parts water. If the floors are carpet, try putting down baking soda. It should not only soak up the moisture and bleach out any stains, but it works well on the ammonia smell. A good practice to prevent stains is to train your dog away from certain areas of the house. Use baby gates or clicker training, to keep the dog from entering rooms with carpet, or expensive furniture, or anywhere it would be difficult to sweep or mop in case of an accident. If you've got a home full of carpets, and there isn't much that can be done about it, it's that much easier for the smell to become a problem. Odors get caught in carpet fibers. Dog hair can become charged with static. But how to get rid of dog hair everywhere? Not only floating through the air or on the furniture, but deep into the carpet fibers. Hiring a steam cleaner regularly may seem a bit expensive, but you could always rent or purchase your own. Make sure you're using pet-friendly or natural cleaners. If you're choosing a company, you'll want to know the cleaners they are using, and also check that they will handle stains, and upholstery as well. Let them know about your pets ahead of time. Many carpet cleaning services already have policies in place for handling pet related odors and stains. They know how to get rid of pet odor in carpet. You can also have your own carpet pet hair remover if you have the time and energy. Many things can have an impact on the air quality in your home. Pets are just one. Smoking, using a humidifier, even just dust and allergens can impact your air quality. Pet dander can cause long-lasting health issues like allergies or asthma. An air purifier can drastically cut down on pet dander, dog fur, and odor molecules in the air. That leaves the air in your home feeling cleaner and fresher. 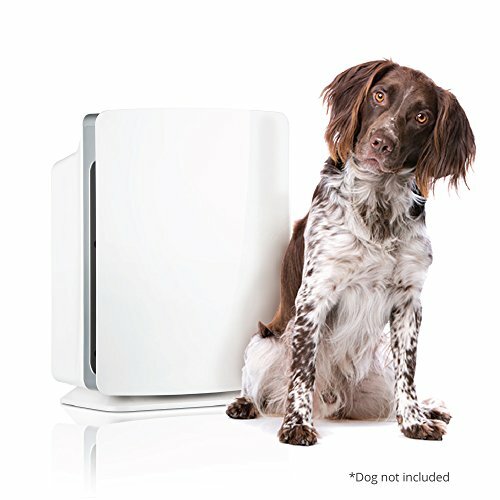 Do you want an air purifier for pets you can move from room to room? Or a system for the whole home? Where it will fit is just one aspect to consider. You may also want programmable timers, for when you're on a schedule, and filter change indicators, so you won't forget to change them out. Changing your air filters does nothing to keep your dog clean, but it does impact the air circulation in your home. And that can risk the quality of your airflow, and that can add allergy and breathing risks. Ideally, you should change your air filter system every two months with pets. But as we've already mentioned, some air filtration systems offer you an indicator when it needs to be changed. You have to change your air filter according to the number of pets you have. Filtered air is well and good, but nothing beats properly airing things out. 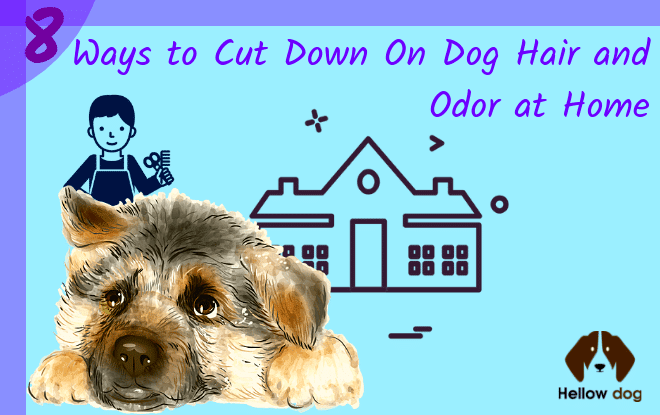 Open windows and doors as often as weather permits, to keep the smell of dog from permeating. Therefore air circulation is an important factor also. Fans work too, as long as you keep your home dusted and swept. Hairs blowing around the house is the last thing you want! So, better be careful about that. Dogs get into trouble. They go in the same places repeatedly, and they tend to track mess when they've spent a day outdoors! As well as properly training your dog so she knows which spaces are hers to explore, keeping your home generally clean will stop problems with pet odor from developing. Dust often, to rid your home of stray fur, and keep the floors squeaky clean. 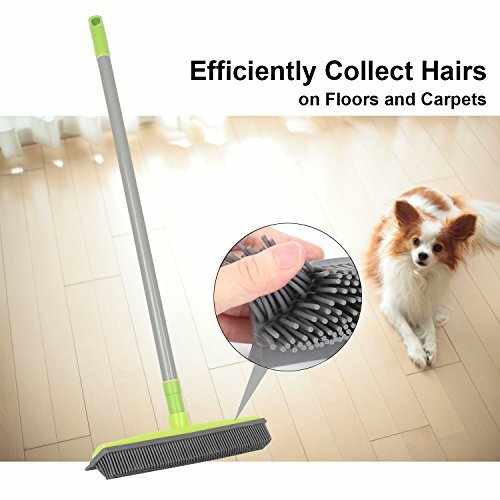 If you need to sweep, sweep gently, to avoid stirring dust into the air. Another great tip is to keep your own linens washed. Letting your dog sleep on your bed might seem like a good idea at the time, but it leads to odors. Keep your sheets, and bedding washed, and hang them to dry, to get them properly aired out, and fresh. If you've got an upholstered couch or chair he likes to hang out in, you may want to change it for a more modern leather one. They collect less hair, and as a result, less odor! Many dogs show interest to the smell of your laundry. Clean or dirty, it still smells like you, and that's all an energetic dog needs to feel soothed. So keep those piles carefully shut away in a hamper, basket, or closet! Spraying lemon juice or vinegar at your dog's favorite spots will deter 'accident.' A dog's nose is much more sensitive, and the heavy, acidic smell can put them off. Spraying a few drops of vodka on your furry friend's bed, or favorite cushion can also cut down on the scent. Other natural odor deterrents include citrus juice, and also baking soda. Baking soda can also act as a bleaching agent. It's great for stains, but it may cause bright colors to wash out if you're not careful. When all else fails, perfume your home. If you're not impressed with the array of air fresheners on the market, try something more natural. Burn essential oils or incense. You won't want anything too strong, but lavender or sage is safe for pets, and will still leave the air fresh and fragrant. Make sure the burners and oils are out of reach of your pets. They can be dangerous when concentrated. Keeping the dog in a designated space is a help, but making sure that his belongings are also kept in a designated area will help cut down on odor and shedding, as well as bacteria that can harm you, and your pets. The best way to keep your pets healthy and happy is to keep them clean. That's not just about bathing and grooming. Pet beds, clothes, even favorite toys, and blankets should be regularly washed. Both water and food dishes should be cleaned regularly in warm water, to avoid the risk of stagnant water, and bacteria. Your pet is sure to love having fresh blankets and bedding regularly, and you'll love the nice fresh smells in your home! 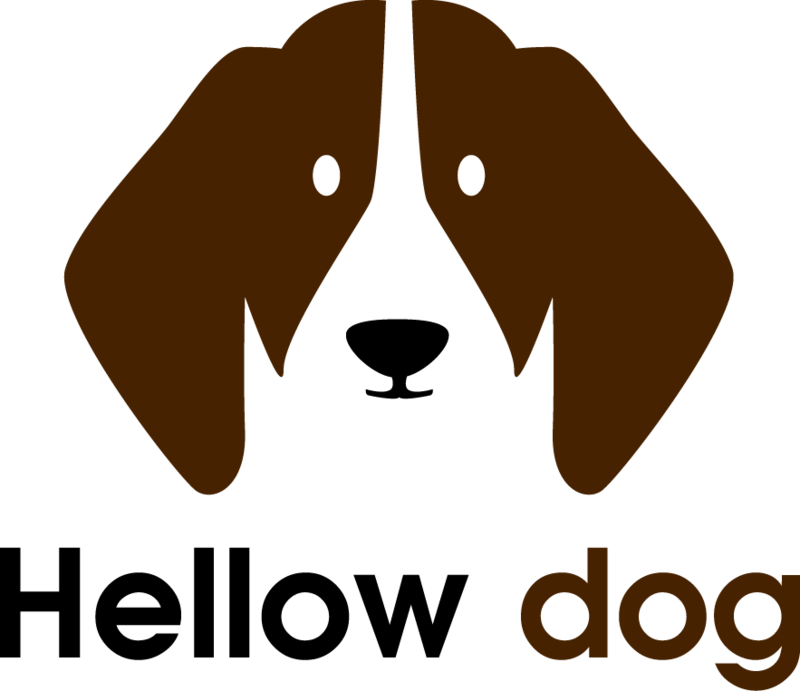 Dogs are great companions and valued members of the family. But as much as we love them, you can't deny some parts of having a pet can get messy. Doggy smells can be caused by shedding, not airing out enough, or even just a busy day of adventuring outside. But no matter how messy it gets, you and your dog can still enjoy a clean, fresh-smelling home. Follow these tips, and we promise you, and your guests, will never even notice the dog!